On September 3, 2015, Ovarian cancer survivors and FDA Patient Representatives Peg Ford, Susan Leighton and Annie Ellis were invited to provide the patient perspective at the recent Ovarian Cancer Endpoints Workshop hosted by the Food and Drug Administration (FDA). This meeting was co-sponsored by the Society of Gynecologic Oncology (SGO), the American Association for Cancer Research (AACR) and the American Society of Clinical Oncology (ASCO). Many important topics to the ovarian cancer community were discussed, including novel clinical trial designs, biomarkers, and new classes of agents such as immunotherapies. You can view the agenda here and the workshop and all slides from the meeting are available through the FDA’s website. Peg Ford’s presentation on becoming an FDA Patient Representative and the training needed for training ovarian cancer survivors to become research advocates. Annie Ellis’s presentation on the importance of Quality of Life (QoL) and Patient Report Outcomes (PRO) measures in clinical trials, which included results of a recent ovarian cancer survivor survey. 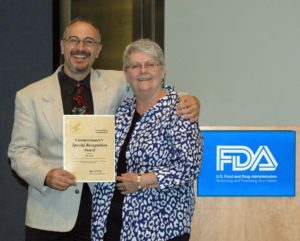 Additionally, Peg Ford was presented with the FDA Commissioner’s Special Recognition Award as a member of the 2014 Patient Representative Team at this meeting. The Award was given for successfully conducting the highly valuable and effective 2014 FDA Patient Representative Training Workshop.